Posh Puppy Boutique comes to the Westfield Mall at the Roseville Galleria! In 2008 Westfield Mall made some HUGE upscale renovations costing over 200 million dollars. Many new stores have entered this remarkable shopping mall to be included in the 400,000 sq ft growth! Some of the new luxurious stores include: Louis Vuitton, Crate & Barrel, Tiffany’s and Restoration Hardware. Stores such as Macy’s and JCPenney have upsized their stores and there are many new additions to restaurants and eateries. 2009 will be a very exciting year for this wonderful shopping mall with the 2nd phase approaching, new retailers will be Lacoste, Juicy Couture, True Religion and Tommy Bahama. Posh Puppy will also have a store located near JCrew in center court on Level 1 where there will be a selection of upscale doggy wear. A great little pet boutique dedicated to family, pets and gives to many charities along the way. This wonderful family owned pet boutique is a great place to find items that cater to your doggie and have great gift items! Go on by and say hello! 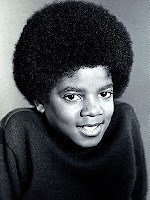 I must say… although I thought he might have been strange, I loved Michael Jackson’s music. I can remember my high school friend (Val) and I skating to “Keep on with the force; don’t stop till you get enough” ! What great times.. No worries, just a bunch of friends have a great time to great music. Who would have known all the drama that would surround this music man later in life. As I watched the very moving public service for Michael Jackson, I was deeply moved by the words that were spoken about him and know that there were still people in the world that loved him and were saddened and shocked by his death. 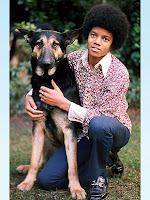 I even learned that Michael Jackson and the Jackson family once owned a German Shepard, Louie, I really thought that is choice of pets, were the exotic animals. What better way to show your mourning for Michael Jackson than to put your best buddy in this “Goodbye Michael” Rhinestone Doggie T-shirt. It will fit any doggie from a Yorkie or small to a German Shepard! It comes in sizes X-Small to a whopping big doggie size 6X! It is affordable and the rhinestone paw is just lovely for the honoring of Michael Jackson. If you are one of the many people on this earth that adored and liked Michael Jackson and his music, be the first to put your doggie in this great “Goodbye Michael” T-shirt. Thank you Posh Puppy for carrying this doggie shirt honoring Michael Jackson. Here comes the Bride.... and the dog! Many pet owners and celebrities these days are choosing to include their pet(s) in their wedding. In many cases, the pet attending or in the wedding happens to be a dog, since dogs are most easily trained and social but I understand that cats, parakeets and other little ones have been a part of those special days too. I remember my sweet beloved Taylor (my first Weiner-dog) and how precious he was to me but I cannot say how he would do in a wedding and I am not sure if I would have wanted to find out. I understand that it is all in the wedding planning. If you do not know how your pet will react around a group of people, I am not sure I would take the chance. Pets can be very unpredictable at times and over e xcited. BUT… if you are sure Fido will be an added blessing for your wedding day, I say GO FOR IT! 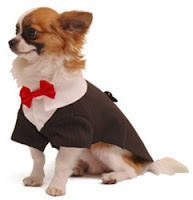 Why not I guess, there is even an online game where you can dress your pet for the big day. Freeplaynow.com offers a free online game where you change out outfits on your pet to participate in the blessed event. If you want a dog tiara, just add it on, if you want her with a doggie wedding veil change it up and you are ready to roll. Find out if the establishment allows pets whether it be in a church or reception hall. Make sure you tell your Wedding Planner about the plans to include Buster. She should know exactly what to do. Appoint a “temporary guardian” to be with your dog during the entire event making sure he is not overwhelmed, or needs water or simply to “relieve himself”. Always have a “Plan B”, just in case things don’t go as planned. Again.....unpredictable pets can cause an unpredictable outcome, so rehearse, rehearse and rehearse again. 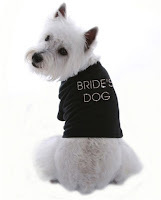 Most importantly in my book is for your pet to look good at the wedding!! 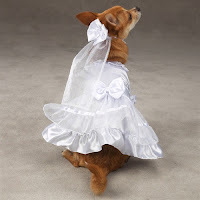 Bridal fashion for dogs, whether they are tying the knot or involved in their owners wedding is so crucial. There are precious dog wedding outfits out there. You can spend as low as $25.00 all the way up to a $215.00 for this great Diamond Jim Leather and Swarovski Crystal Dog Vest. Don ’t forget the wedding dog accessories either… the veil, the dress, the tux, the jewe lry, hat and the bachelor party wear! Make sure your photographer includes your party go-er as well and have a wonderful wedding!